Research and Inferences Offered by Judi Moreillon, Ph.D.
Song: "The Battle Cry of Freedom"
With whom would I like to have dinner? Quote: "Whenever I hear any one arguing for slavery I feel a strong impulse to see it tried on him personally." Fellow citizens, the news has just reached me that the Battle at Gettysburg is thankfully over, but not before tens of thousands of brave American soldiers died on the battlefield. We are American people. We must preserve the Union. Together, we can overcome our problems. Let us stop this war of brother against brother. We are all blue; we are all gray. We are all one nation. 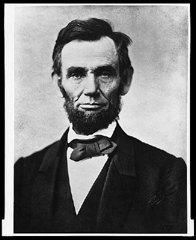 "Abraham Lincoln, Head-and-shoulders Portrait, Facing Front." Library of Congress. Web. 15 Jan. 2011. <http://loc.gov/pictures/resource/cph.3a53289/>.